It's never been easier to submit your products to Froogle, You don't need to own or learn Excel or an FTP program to submit your items. Single Store Edition. The most recent entry in the Speedo line. It's never been easier to submit your products to Froogle! No more spreadsheets. You don't need to own or learn Excel or an FTP program to quickly submit your items. The Product Wizard with detailed explanations walks you through adding your product step by step, and lets beginners submit products to Froogle in minutes. Database driven. Will hold unlimited products. Just fill in the boxes and click Generate. Built-in FTP sends the file to Google's server (Internet connection required). Search products by name or description. Searchable Notebook to store your notes. Product Wizard makes adding products a snap. Submits to a single store only. Pro Version available soon. Sign up for our Mailing List for announcements of updates and new releases by email. 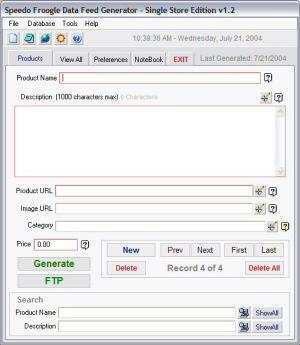 Password Generator 2003 - Extreemly customizable random username and password generator !